Womble lovers had another chance to meet Haydon and Orinoco at this year’s Wimbledon Village Fair on 18 June. The annual fair on Wimbledon Common is one of the biggest community events with more than 200 stalls and attractions, and raises funds for the Wimbledon Guild to support local people in need. This year, the newly promoted AFC Wimbledon football club was asked to open the fair. BBC sports presenter John Inverdale interviewed the club’s commercial director Ivor Heller, star penalty-saver Seb Brown and mascot Haydon the Womble. They lined up on stage with the Mayor of Merton, her husband and niece, the Chairman of the Guild, and the MP for Wimbledon. 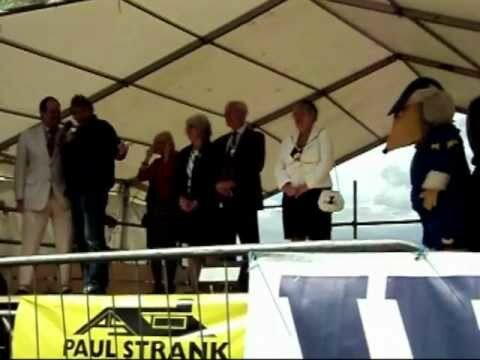 To officially declare the fair open, Haydon took a death-defying leap off the front of the stage – landing safely on the ground where he greeted local children and waved to the crowd. Afterwards, Haydon walked around the fair to meet his fans, and showed off his football skills at the AFC Wimbledon stall. Alongside club merchandise and a new range of T-shirts celebrating the club’s promotion to League Two, AFC Wimbledon also had a box of assorted second-hand Wombles cuddly toys for sale, ranging from the common 1998 variety to some rather odd-looking older toys. Torrential rain arrived at lunchtime, no doubt attracting a good crowd to the big food and craft tents, while everyone else huddled under the nearest stalls for shelter. Poor Mr Alexander had to abandon his Travelling Show halfway through (although he was able to resume later, once the sun reappeared). In the Wimbledon Bookfest marquee, there were book signings with local authors, and children’s activities including storytelling, colouring and face painting. 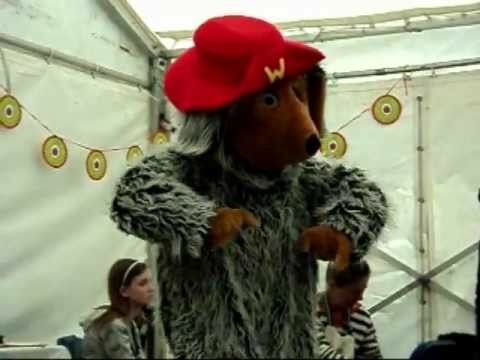 Writer and musician Julian Butler read the first chapter of The Wombles, and led a singalong of The Wombling Song (which entertained the parents as much as the children – or perhaps more), while Orinoco joined in with the actions. Click on a picture to see larger versions, and watch videos below. @TidyBag @HaydontheWomble he is one fearless mascot!!! @TidyBag that’s a fab photo!